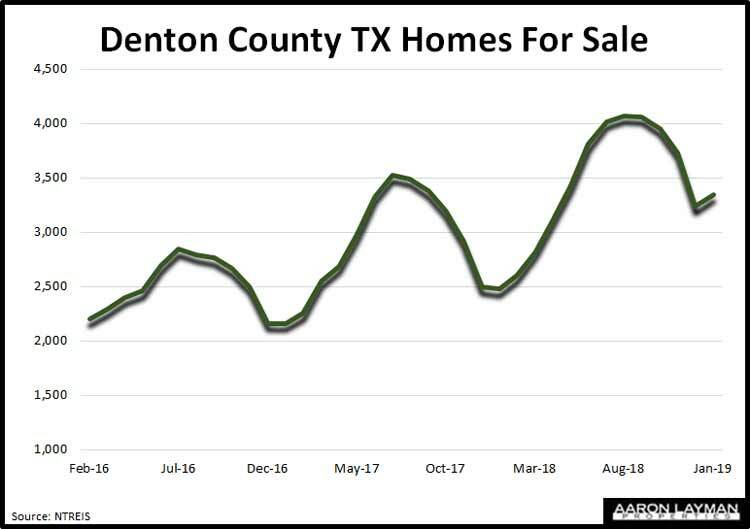 Denton County home sales remained in their downward trend as we started 2019. NTREIS figures show that sales of Denton County homes fell 13 percent from the same time last year. Pending sales, a more forward looking indicator, did show a slight improvement, though not enough to pull the index into positive territory. 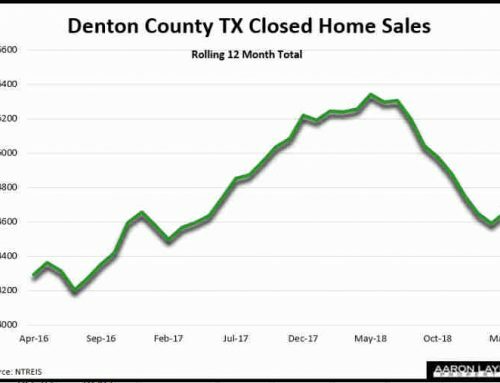 Pending home sales in the Denton County area were down 6 percent compared to January 2018. 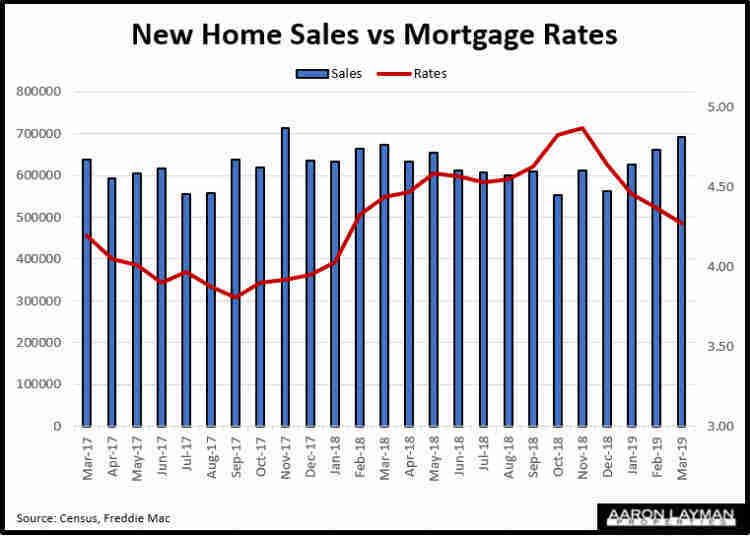 The recent plunge in mortgage rates back to 1-year lows has helped to cushion the fall in an otherwise stagnating housing market. DFW home sales fell 11 percent in January, posting the lowest one-month total for home sales in four years. 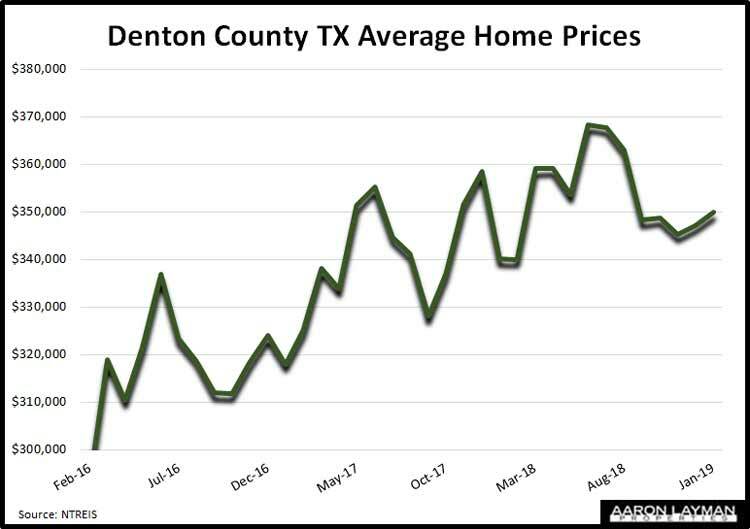 Median home prices in Denton County rose 2 percent in January to $300,000 while the average price of a home rose 2.9 percent to $349,927. Months of supply were up 47 percent to 2.8 months. 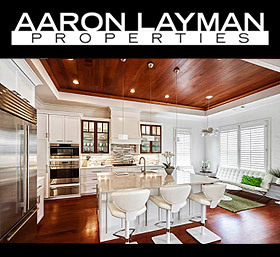 There were 35 percent more homes available for sale (3342) than at the same time last year. 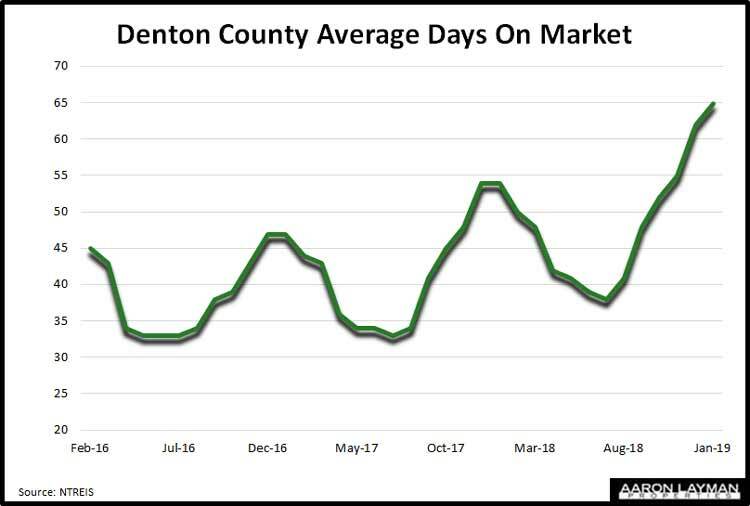 Average days on market have risen by 20 percent, and it took over two months to sell a Denton County home in January. The City of Denton saw median home prices rise 9 percent in January to $261,500 while average home prices inched up slightly to $274,779. Denton was sitting on 2 months of supply in January, a rise of 33 percent from the same time a year ago. Days on market rose to 50, a number that Denton home sellers haven’t seen since 2015. This is the kind of action you see when a real estate market turns. 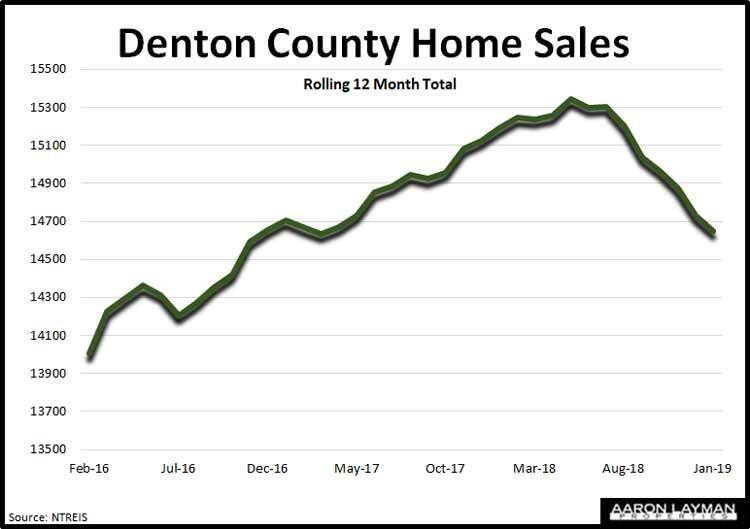 The sales decline for the City of Denton was in line with the county average though pending sales activity was weaker, falling 11 percent from the the same time a year ago. 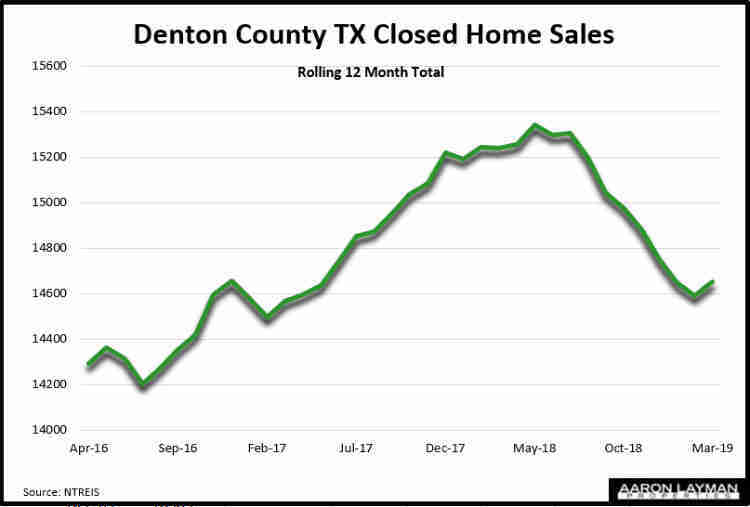 It would appear that the recent market swoon has done some lasting damage to home buyer confidence in the Denton area. It probably doesn’t help that nearly half of Denton’s households are struggling to make ends meet, this according to the latest ALICE (asset limited, income constrained, employed) report for Texas. Roughly 40 percent of Texas families fall into this category, spinning their wheels as the Federal Reserve works behind the scenes to bail out Wall Street at every turn, exacerbating U.S. wealth inequality as a result. The truth is that we all know ALICE, but no one in the establishment wants to talk about ALICE. The real estate industry certainly doesn’t want to talk about the issue of wealth and income inequality in the U.S., but they will be forced to deal with the consequences regardless. The continued stagnation of the Dallas Fort Worth real estate market has finally caught the attention of the Dallas Morning News, although real estate editor, Steve Brown, did not waste the opportunity to offer another laughable statement from a local housing market pundit. The sell-side housing cheerleader of the week award goes to Ted Wilson of Dallas-based Residential Strategies. Apparently Ted has been out to lunch during the last few months in terms of what is playing out in the bond markets and the Federal Reserve’s complete capitulation on policy normalization. This statement from Wilson attempting to boost home buyer confidence is rather amusing. Sorry, Ted. Apparently you didn’t get the memo. 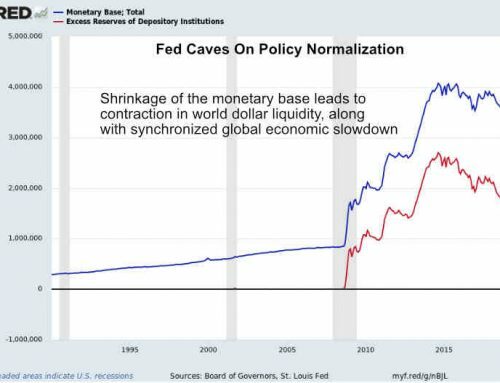 Fed chairman Jerome Powell is just like Janet, Bernanke and Greenspan before him. 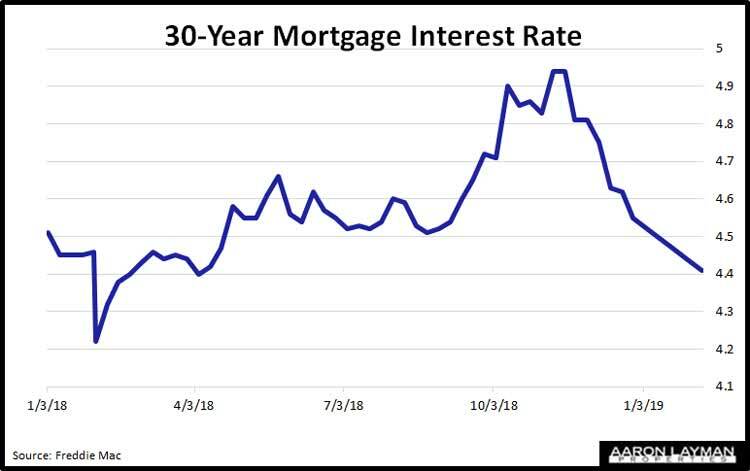 In case reality has failed to sink in, mortgage interest rates aren’t likely to go much higher anytime soon. The reason should be obvious, but I will channel my inner Lacy Hunt and just say…It’s the debt! 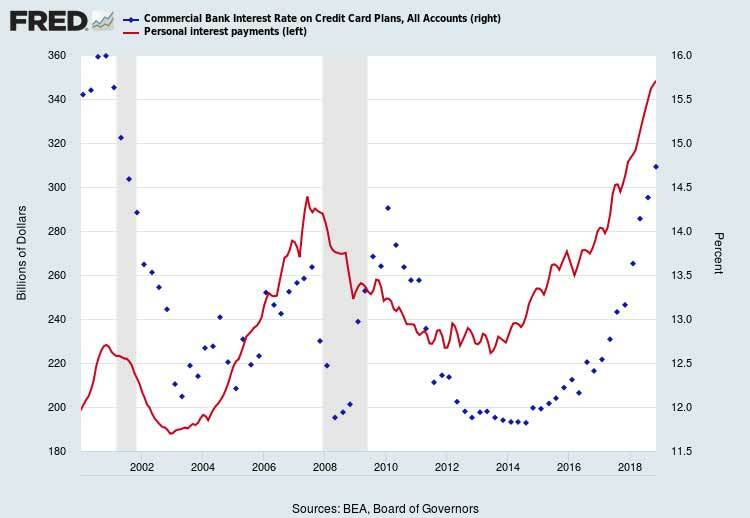 If we learned anything during the second half of 2018 it’s that the markets cannot withstand higher interest rates. 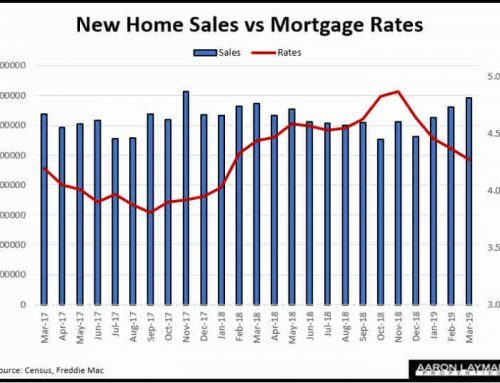 Mortgage rates didn’t even hit 5% before home sales started cratering before our very eyes. As I predicted would happen, actual home prices are also rolling over in many DFW submarkets. Prices in Frisco Texas fell again last month, but other Dallas-Fort Worth communities also took a dive into negative territory in January. Average home prices in Keller were down 14% January while prices in Irving declined 12 percent. Prices in North Dallas and East Dallas also fell 12 percent compared to the same time a year ago. The improvement in pending sales activity for January was a welcome sign, but it still wasn’t enough to pull contract activity back into the green even with mortgage interest rates near one-year lows. What should be a more concerning development for housing industry apologists and cheerleaders is that recent developments have come on the back of one of the strongest bull markets in U.S. history. 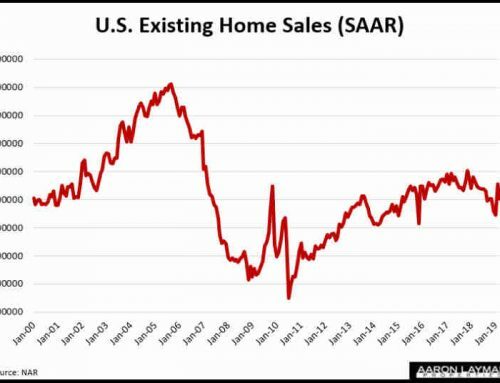 10 years into a “recovery” and home sales are stagnating. Prices are rolling over at the margins. 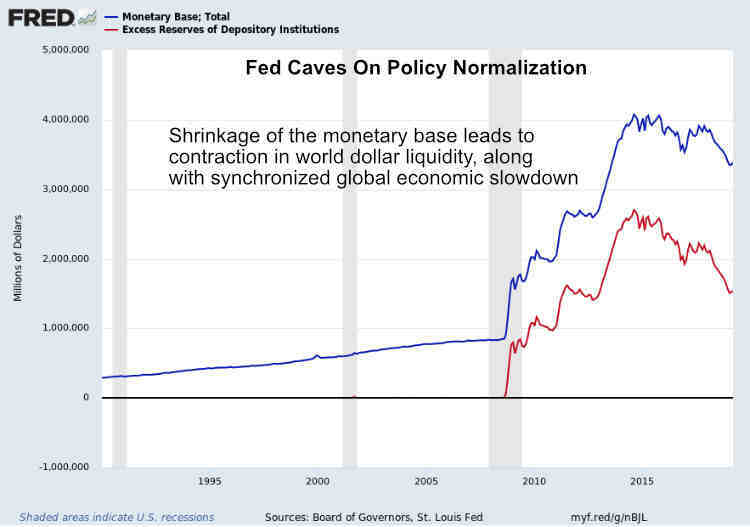 Of course this is all happening with near record-low unemployment and the Fed Funds rate at only 2.5 percent. 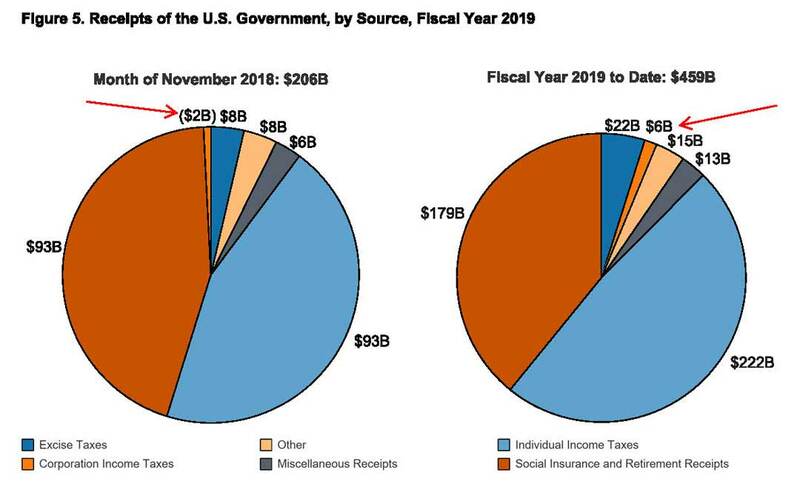 For the millions of American families who didn’t really see any improvement in their bottom line in 2018, remember that U.S. banks just reaped a $21 billion windfall courtesy of the Trump tax cuts. This is while they were busy laying off employees last year. Publicly traded homebuilders also benefited from the corporate giveaway last year. 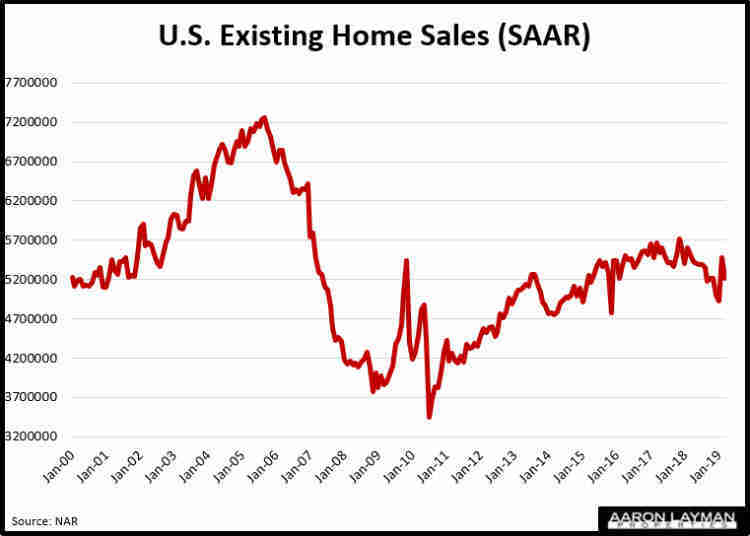 Even with huge share repurchase programs, homebuilder stocks are wavering as new home sales continue to stagnate. Closed and pending sales of new construction were down in the DFW area during January even with the average price of a new DFW home essentially flat compared to a year ago. Builders have a monumental task on their hands. It’s tough to build affordable homes when every piece of real estate on the planet has been artificially inflated by central bank policy. I am not surprised at all that Jerome Powell has proven to be just another puppet for Wall Street. 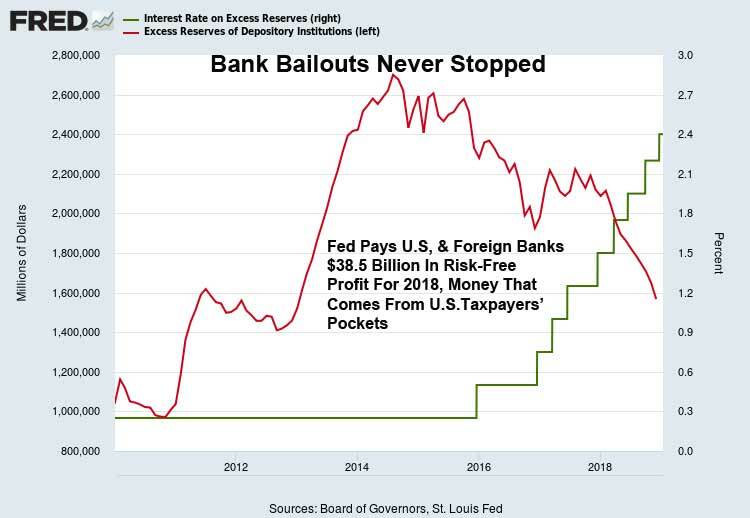 It should be no surprise that Fed officials are openly contemplating perpetual bond and asset purchases to keep a sinking ship afloat. 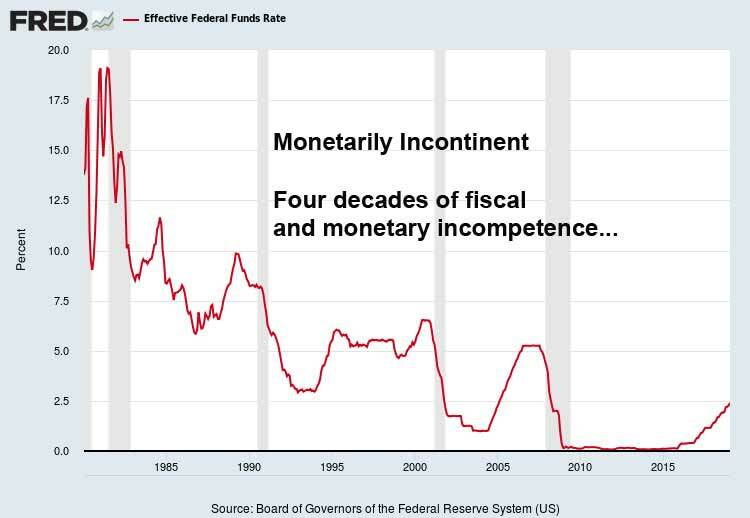 What do you seriously think the masters of monetary mayhem will do when the U.S. enters a recession with global growth slowing, with unemployment this low, public debt to GDP north of 100 percent, $9 trillion in corporate debt and virtually no effective policy tools at their disposal? Well guess what ladies and gentlemen…we will likely soon find out.